What form of payments are accepted at the lodge? Are children allowed at the lodge? Where can you have lunch? At the restaurant in the lodge. Is self-drive allowed at Fathala Wildlife Reserve? 4×4 Cars are allowed for Day Centre visitors with a Fathala Guide, But all Game Drives for lodge guests are done with a Fathala 4×4 Game Viewer. Insect repellent, sunscreen, clothes suitable for extreme heat, closed shoes, international adaptor for phone chargers. 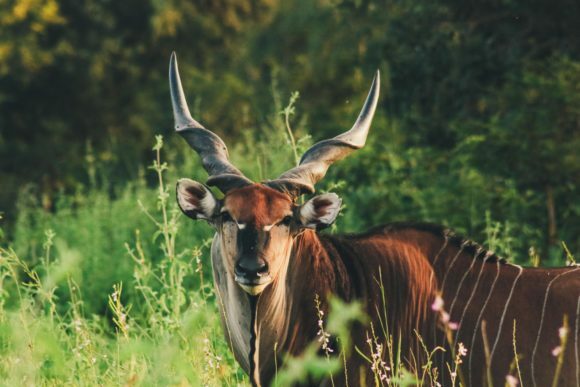 Fathala Wildlife Reserve helped make a success of saving the rarest and most beautiful of all antelopes (Lord Derby Eland) from extinction.